I feel like I should apologize for not blogging yesterday, I was out couponing and catching up on chores. Today totally makes up for a funless Wednesday though! My mom came over to watch the boys while Jy and I hit a matinée showing of Mission Impossible 4. I had called it MI5 in a previous post, oops! Crazy or not, no one can carry an action movie like Tom Cruise. Once again, he was amazing in this movie. Can you think of another action star as big as Tom Cruise? The only one Jy could think of was Matt Damon (a la Bourne Identity.) Damon just looks old and slow now (We Bought a Zoo). My palms were sweating the whole MI4 experience long, it was just so fun! Now, on to today’s Movies & Munchies. I’ll let Mr. Movie Fuel do the talking here as we talk about Life Is Beautiful. Life can be difficult, life can be spectacular. When life is good, we sometimes take much for granted. Moreover, only the most optimistic of us can take the bad times and turn them into something positive. Perspective and attitude are two of our greatest defense mechanisms when times get tough. Movies for me, are a great source of perspective. During the winter holidays, we are reminded to pay attention to the fruits of life that aren’t materialistic with a film such as, A Christmas Carol or It’s a Wonderful Life. A positive attitude, especially when faced with adversity, is a great attribute and source of strength in life. Jim Harbaugh, coach of the San Francisco 49ers, often tells the story about how growing up as a poor kid in a small town in Ohio, his father would always accentuate the positive. During the rare occasion when they did have a family car, it was usually a beat up old hooptie on its last wheel, but when they drove it, they got to all be together as a family. Jim’s father John always had a saying that he would yell out, “Who’s got it better than us!? !” and all of the Harbaugh kids would yell out in unison, “Nooobodddyyy….” Neither party said this with even a hint of cynicism, they truly believed that no one had it better than them, mostly because they were able to maintain an attitude of appreciation for what they did have. He’s used this as the mantra for the professional football team he now coaches, a team which was terrible the previous season before he became head coach, but is now being considered a possible super bowl contender after one year of Harbaugh’s contagious spirit and emphasis on being a team to the fullest extent possible. One film that personifies that statement and somehow elegantly blends perspective and attitude into what would otherwise be considered a horrific situation is the Italian picture Life is Beautiful. Part love story, part historical film, part comedy, part family film, part tear-jerking drama, Life is Beautiful has just about everything. Roberto Benigni, the star, director and writer of Life is Beautiful has often been described as the Italian Charlie Chaplin and he certainly fits the bill. Gifted with both the art of physical comedy and the ability to do something completely unexpected at any moment, Benigni makes you forget you are watching a movie about atrocities in history and envelops your imagination for nearly two hours, while tears roll over your smiling face. This is not to say that Benigni makes a farce of the holocaust, rather he takes on a daring subject matter and tells it in a way that hasn’t been done before. He manages to demonstrate how hope can exist during the harshest of situations. 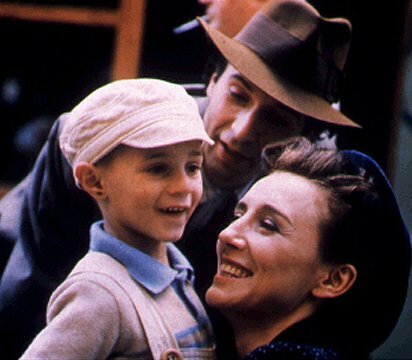 We also watch as Benigni shows love through self-sacrifice, the ultimate “hats off” to parental love. Through one of the most extreme situations possible, Benigni uses a loving lense to see through the story of horror and find life’s most precious gift, hope. In the new year, as we find ourselves in challenging situations, we can either try harder to make a bad thing better or when things become too hard, try not to control the situation and focus more on how we can have a healthy reaction to that which is out of our control. Just maybe, when things are good we can fully appreciate that life is beautiful. Have you seen this movie? It’s so wonderful and hard to watch, especially as a parent. Here lies the challenge. How do you pick a food to pair with such a movie? 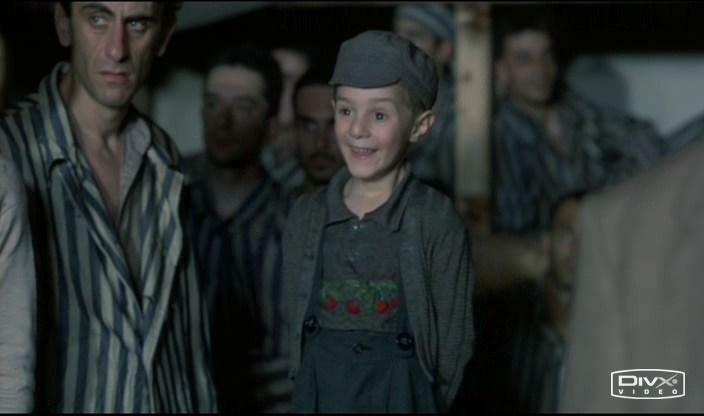 There is no special recipe to go along with a movie like Schindler’s List or The Pianist. I wouldn’t want to disrespect the whole story telling experience of these fwilms by likening them to any other drama you’d want to munch popcorn along with. They are entertaining, but these movies were not made with the sole purpose of entertainment. Instead, I have pulled my “family” cookbook off the shelf. It is a cookbook that my Aunt Debi put together for Jy and I when we got married. It holds family stories and recipes collected from my Nana (as in banana) and my great grandma, Grandma Ann. They are my Jewish side of the family and the source of homemade and heartfelt, Hebrew recipes. One of the recipes that has seen much light lately is the Mondelbroit card. My dad has been honing his Mandel Bread (what we call it) skills. Mandel Bread is similar to biscotti. I’d love to share Grandma Ann’s recipes here. While I have not made it yet, I hope you will join me in trying it out soon. According to my dad, it’s not too hard at all. According to me, it’s yummy. Beat eggs and sugar until light. Mix in remaining ingredients. Add sifted flour with baking powder last. Dough should be very soft. Shape two long loaves (with floured hands) directly onto a greased cookie sheet. Loaves should be 3" wide and only 3/4" high. Bake in a 350 degree oven for 40-50 minutes. Tops should be light brown. Remove from oven and immediately slice diagonally into 3/8" wide slices. Place the cookies back on the cookie sheet (cut side up) and sprinkle with cinnamon sugar. Bake in oven for 5-7 minutes more. Come back tomorrow for some Friday food!